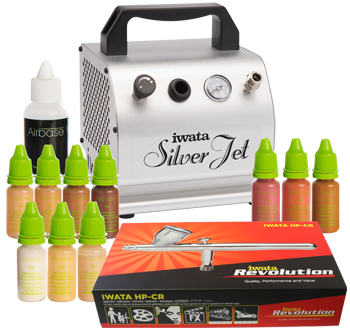 The Iwata Silver Jet compressor is attractive, lightweight, portable and is the perfect companion for applying Airbase HD Airbrush Make-up. 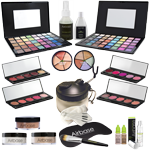 It is suitable for mobile or occasional use for up to half hour sessions. 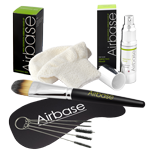 If you need a compressor for heavier use, please click here to view our Airbase Airbrush Kits. 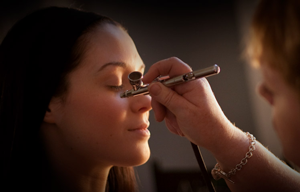 The Silver Jet incorporates a pressure adjuster which is extremely useful when airbrushing make-up as it allows you to reduce the pressure when working on the face, particularly around the eyes. For further convenience of control you may add an end-of-line Sparmax bleed valve, an end-of-line moisture filter with bleed valve or a quick release body with air valve with a quick-release plug. And you may upgrade the foundation pack to 30ml bottles (with 100ml Thinner & Cleaner). Please select from the options at the top of this page.